In the days before the 71st anniversary of the horrific Hiroshima and Nagasaki Atomic bombings , on August 6th and 9th respectively, we must reflect on how we can move away from the nuclear brink. 15,350 nuclear weapons remain in the arsenals of nine states, approximately 1,800 of which are on “high alert” status and can be launched within minutes. 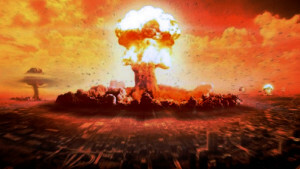 Worse still, the United States has committed to a massive, 1 trillion dollar nuclear weapons modernization programme, with the other nuclear weapons states following suit to one degree or another. The latest to commit to a hugely costly modernization programme is the United Kingdom. For an impassioned argument on the illegality of the use of nuclear weapons, published on the eve of the UK Parliamentary vote, see: Using Trident would be illegal, so let’s phase it out, by Geoffrey Robertson (The Guardian.com, 15 July 2016). Alarming new risks include an attempted coup in Turkey involving the very military base where American tactical nuclear weapons are stored. See: The H-Bombs in Turkey by Eric Schlosser (The New Yorker, 17 July 2016). Today, the danger of some sort of a nuclear catastrophe is greater than it was during the Cold War … and most people are blissfully unaware of this danger. In light of these alarming developments, which put the very future of the planet at risk, the Canadian Network to Abolish Nuclear Weapons and 44 sponsoring civil society organizations including the Rideau Institute have issued a Call to Action to the Government of Canada to PLAY A GREATER LEADERSHIP ROLE IN THE ABOLITION OF NUCLEAR WEAPONS. We urge vigorous diplomatic action and civil society engagement towards the negotiation of a comprehensive, legally binding convention that prohibits nuclear weapons and requires their verifiable elimination. Click here for the full text of the Call to Action and the list of sponsoring organizations.